Hotel Kyriad Colmar - Centre Gare, is less than a half a mile from the heart of the old city and the train station, located in the historical neighborhood of Colmar. It's 41 newly classified 3-star hotel rooms await you for a cozy stay in a pastel environment. Hotel Kyriad Colmar - Centre Gare is the ideal stopping point to explore the city and surrounding areason foot or by transit. The proximity of the train, bus and taxi stations, as well as car rental agencies, offer the possibility of going out to explore the entire region. Ideally located in the city center, this establishment keeps up with the pace of life in Colmar and assures you personalized reception 24 hours a day with the constant presence of a night watchman at your service at any time, for your complete peace of mind. All our rooms are equipped with a digital flat-screen TV offering a large selection of French and foreign channels, as well as theme channels such as Canal+, Eurosport, Ciné-cinéma, etc. You have free Wi-Fi and a courtesy tray you can use to make yourself a hot drink at any time, while snacking on our selection of homemade, typically Alsatian cookies. You will also find numerous hospitality products to welcome you along with a very practical hairdryer in the bathrooms. Hotel Kyriad Colmar - Centre Gare offers 41 comfortable rooms for reservation that have been newly classified 3-stars. With a pastel decor, these cozy rooms have a large bed or twin beds and also have a private bathroom with bathtub or shower and toilets. From 7:00 am to 9:30 am, the hotel offers a very complete breakfast buffet full of flavor and vitality. 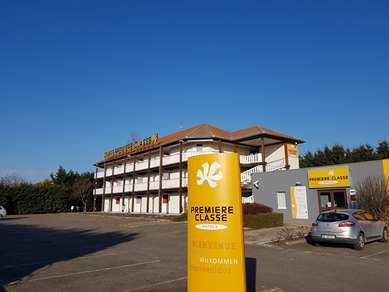 Great location, five minute walt to the train station and to the town center, clean and spacious rooms, helpfull staff. Good restaurant. Very much recommended during Christmass. All and all great atmosphere. We spent 3 days there early November 2018 and liked the location and nearby parking. The hotel is in the middle of major renovations, we disliked the breakfast, me and my daughter got severe stomach upsets after having eaten their scrambled eggs who were not homemade but delivered from a caterer and rehated, so this was a rather sad end to our trip. 500 m from the train station and FlixBus stop, around 1 km from the city center. Everything is accessible by foot. The building is old but the rooms seem to be slightly renovated. I've had a twin room facing the main street, but the noise didn't bother - windows were soundproofed. Room is very small, especially the bathroom, but such is 3* in France. Nevertheless, the bed was firm, shower worked fine - it's the least that is necessary for one night.